When I was just 16 years-old, (just weeks ago by my recollection), I simply got into the car and drove. I had no real destination. There was no devotion to my navigation, and rarely was a chart consulted for guidance. It seems strange to think of the risk I took in doing that, heading out alone with only the cash in my Velcro-secured wallet. I had no mobile phone and no GPS, not even a credit card. I didn’t even have my mother along. It was simply me, the car, and the road. It was wonderful. I got in, put the windows down, turned the key, and was off. I was looking for nothing more than to discover a bit more of this world than I had known when I left the house. Sometimes I was even successful. The road that I chose inevitably led to another one and sometimes two. I was forced to make a choice: which direction would I take? More often than not, it was the one that led further from home. I wasn’t trying to escape home as much as I was striving to embrace freedom. For the first time in my life I could make my own decisions and get myself into some REAL trouble, if I so chose (which I rarely did). 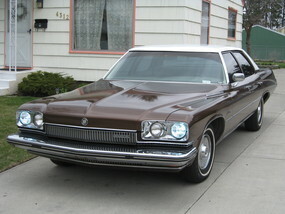 It used to be a weekly occurrence for many in America to pile into the family Buick (a brown ’73 LeSabre in our case) after Sunday lunch and go for a drive. The kids were all stuffed in the back seat and forced to look out the window to observe the world. There were no DVD players or other electronic devices to keep their minds occupied—that was up to the kids’ imaginations and the parents’ route. This drive allowed the family to get out from the city and the suburbs to see some scenery, to witness another style of life, or at least other brands of cars. It offered the opportunity for the children to bond in the back seat, noting various interesting sights and sounds along the way. (Squirrels and the occasional fat man, for instance.) For the parents, it was a time of domestic togetherness: hours spent together attempting to answering children’s constant battery of questions and postponing the inevitable stop to use the restroom. There was never a feeling of guilt for misusing time or the dreaded remorse of a missed game on these drives. The thought of “wasting fuel” didn’t enter into my father’s mind, as he was “spending time” with the family that he cared so much about. He was investing in his own renewable resource. The hours spent in that Buick are recalled fondly by my siblings, except for my sister Jonel. A wire emerged from the upholstery of the lower bench seat, lodging itself into the back of her tender little knee. She was captured by the brown whale and it wouldn’t let her go. Thankfully, a pair of pliers from the trunk freed her from the beast, and the white Johnson & Johnson first-aid kit was kept under the vast front bench seat for just such a moment. (However, knowing what she would put her siblings through in later years, we should have just had her leg removed at that moment as a precautionary measure.) Yet, even with that mishap, I don’t recollect much protest to take the long way home from church or the many family reunions. Why is it such a rare occasion in today’s world for most of us to take time for the aimless drive? We are too preoccupied with our own existence to stick our forearms out of the window and into other peoples’ lives. Are we only concerned about the outcome of the same game we can check in tomorrow’s newspaper? Should we feel guilty for simply being inefficient? Are we somehow breaking society’s rules? There aren’t many rules to follow on a good Sunday drive. One key is to slow down and relax. Even for a 16 year-old, I tended to have a bit of a heavy right foot. I attempted to push the car and myself to the limit and, frequently, well beyond it. Strange as it may seem, this rarely happened on these longer distance drives. I was perfectly content to follow the pace that the road dictated and took in my surroundings. The cinema scenes unfolding in front of me were more than enough to keep me engrossed. The terrain changed with each passing mile. I welcomed the steep hills and deep valleys in the rich River Hills of the southern end. To the west were the flowing sweepers and countless parks along the Susquehanna. North led to anthracite-rich mountains and endless switchbacks of Appalachia. If you knew which routes to follow, the East rewarded you with the little slice of British country estates and hedgerows known as southern Chester County. If I felt particularly adventurous, and my immune system was up to the task, I would venture across the Delaware River to the sandy farmland of southern New Jersey. Another rule that must be adhered-to whenever possible was to roll down the windows. Each season offered a different theatre of scents to take in. Spring gave powerful waves of freshly mown timothy grass, pending rain, and bushes of colorful lilacs letting loose their collective bouquets. Summertime meant a waft of barbeque, hot asphalt, and the occasional agony of Avondale’s mushroom houses. Perhaps the most rewarding of all the seasons was autumn, and every scent in that wonderful season seemed to be centered on leaves, in one form or another. The musty smell of drying piles of leaves fills the car. Those piles often end up being burned with that distinctive scent that seems to make anyone exhale an approving sigh. Wood stoves are first fired to ward off the pending chill and the slow smoke ghosts lift lazily out of masonry chimneys and across the road, blowing into and out of the “cracked” car windows, serving a pungent reminder of the security that a home will provide upon return. As the sun began to hang low on the horizon I would make the decision, with a slight reluctance, to turn around and head for home. The return leg of a journey never seems to take as long as the expedition does, and as the driveway is reached there is often a sense of “I could have gone a bit further.” That is the beauty of the Sunday Drive: there will always be another opportunity, as long as we choose to seize it. When we were kids, we often took driving vacations that involved what Dad called “shortcuts” that were, in actuality, hours out of the way. But always by the most beautiful byways and two-lane roads around. It instilled in me a loathing of interstates and a love of winding roads. Thanks for sharing this, Jansen, and reminding me to see those drives as renewable resources where I can get filled up again.